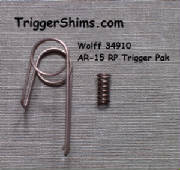 What AR-15 Custom Trigger Job would be complete without our Custom Made 300 Series Stainless Shims? We Manufacture Shims to fit Mil Spec Small Pin (.154") and Colt Large Pin (.170") AR-15 Trigger Pins and Hammer Pins. Reduces Side Play, Reduces Drag and Rubbing of Trigger Group Parts. 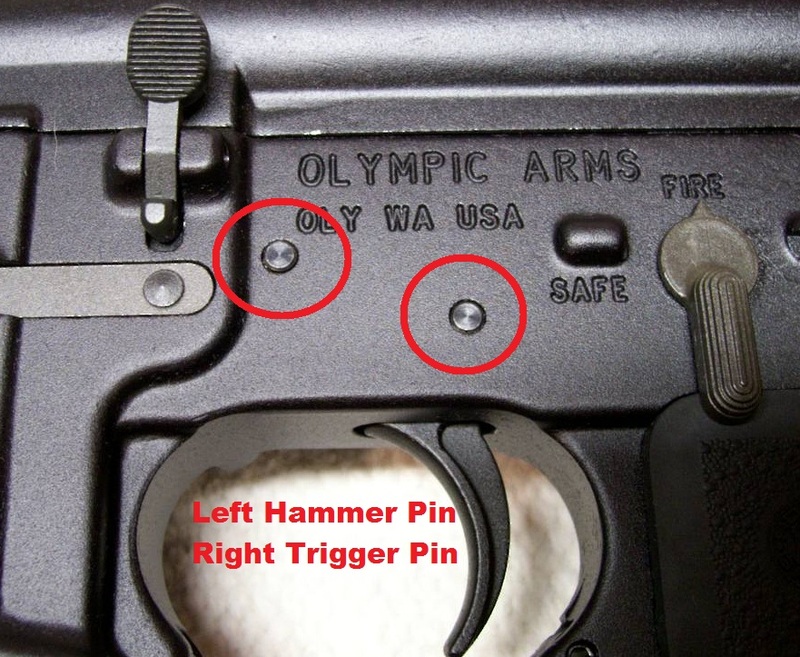 More Consistent Trigger Pull in your AR-15 Trigger Job. 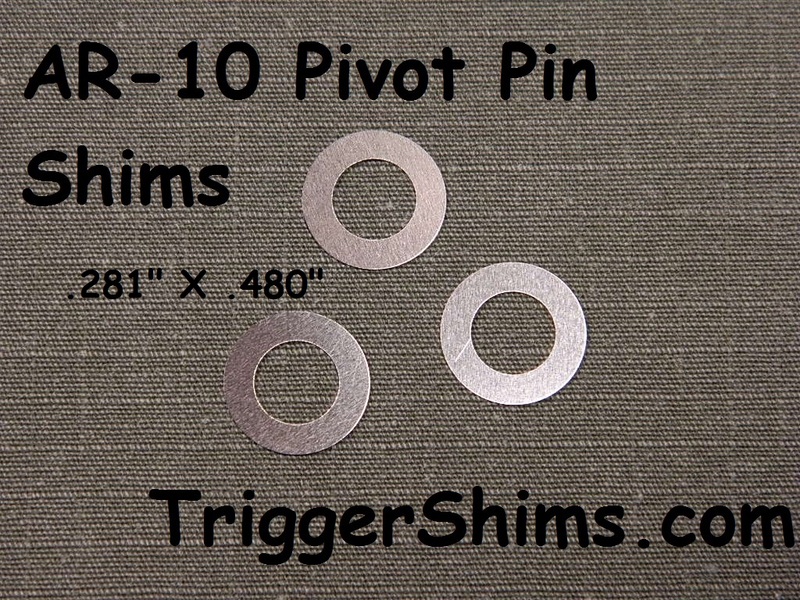 Our Pivot Pin Shims take the Play out of your Upper to Lower Receiver. Our Compensator Shim Kit will make Timing Your Muzzle Device Easy and Effortless. Order Any Kit on This Page and Request Custom Thickness via Email. Need a New Free-Float Quad Rail and Gas Block for your M4 AR-15? Also our UTG Pro USA Made Quad Rail Gas Block Too! Leapers AR-15 Clamp-on Sights are imported, but very well made and an exceptional value! Large Pin or Small Pin? Some civilian Colt AR type rifles were manufactured with hammer and trigger pins and holes which are .170 inches in diameter. These are referred to as large pin Colt receivers. This was not in all Colt models, just some. All other AR type rifle manufacturers have used the military specification .154" diameter hammer and trigger pins and holes, or small pin. The only way to know for sure is to measure your pins or the holes in your lower receiver to determine if you have a small pin or large pin Colt receiver. 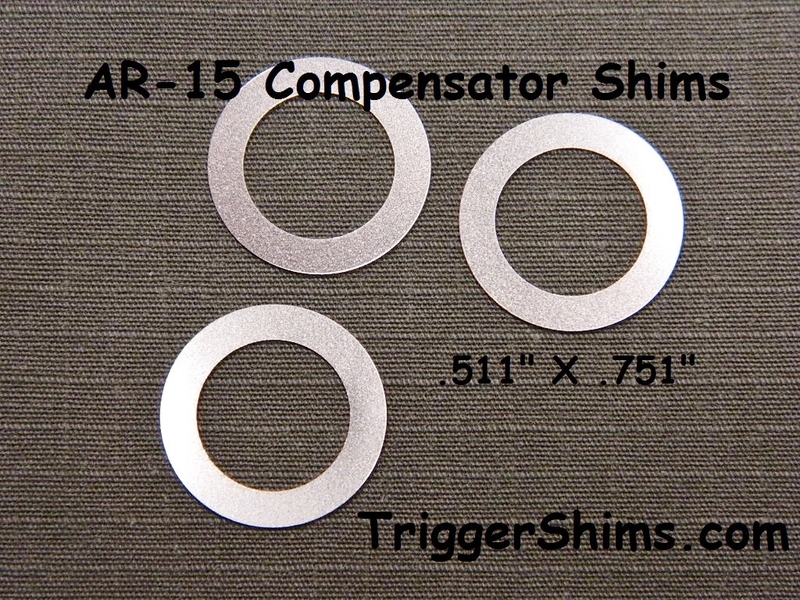 If you are building a Kit Rifle with a Stripped Lower Receiver and a Parts Kit, or own a Factory Built Rifle, Our AR-15 Shims are Easy for Novice or Expert alike to Install. 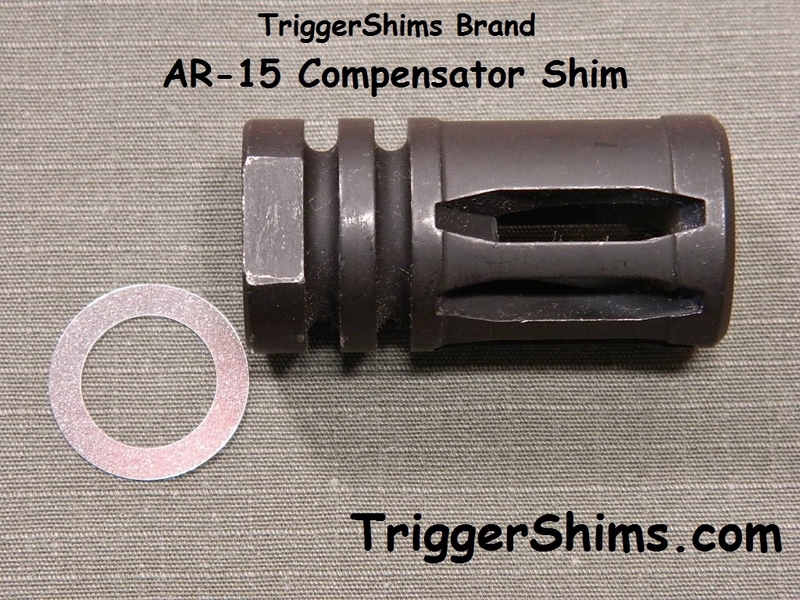 If you are doing a AR-15 Trigger Job, or installing a Trigger Kit, add our shims to take out the slop and stop parts from rubbing. with an AR-15 Trigger Shim Installed to show size. 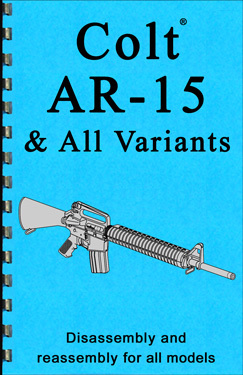 Small Pin AR-15 Style Rifles. Care must be used when installing to insure no binding is present. Remove Magazine and Open Chamber, Make Certain Gun is Unloaded! Remove Hammer Pin and Remove Hammer. Remove Trigger Pin and Remove Trigger. Now Remove the Springs from the Hammer and Trigger, including the Disconnector Spring and set aside. 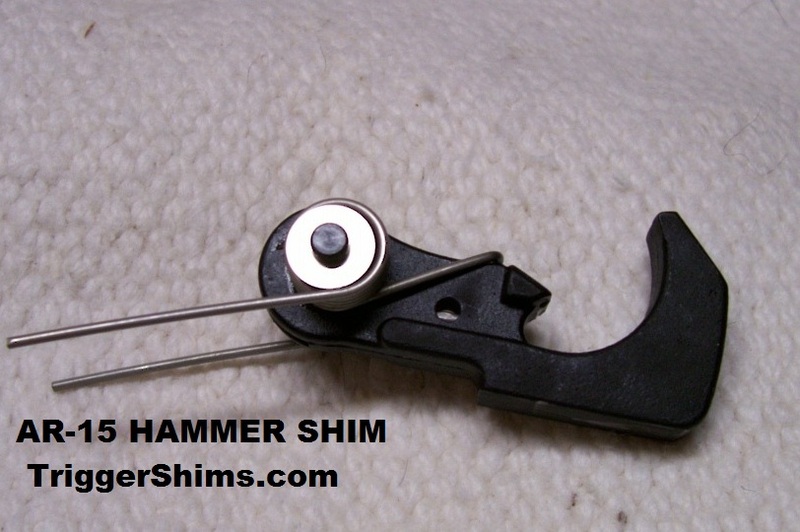 Now you can Re-Install Your Hammer and Trigger Without the Springs and Install Shims to Check for Clearance. This is necessary to Make Certain there is No Binding or Sticking of the Trigger and Hammer. Remove Pins and Hammer and Trigger, Install Disconnector without Spring into Trigger, add Shims, install Trigger Pin and check for proper clearance and free movement of the Disconnector with shims installed. Again, you must be absolutely certain there is no binding and the Disconnector Moves Freely. There is Normally Very Little Clearance between the Disconnector and Trigger, and may not need to be shimmed, or you may just want to skip putting shims in there all together. 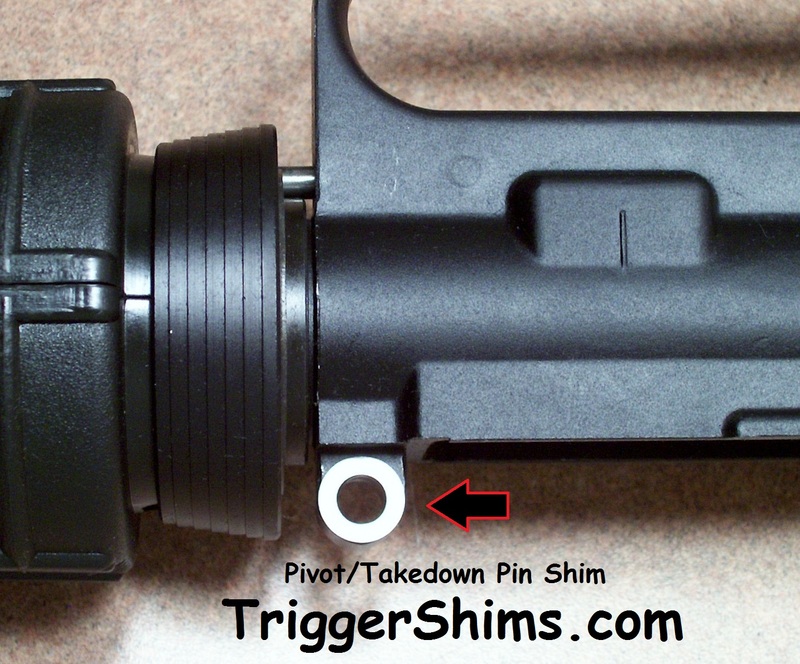 In Order to Shim the Disconnector you will need to use a Cheater Pin, Reassemble the Disconnector and Shims and Spring into the Trigger as a Sub-Assembly. 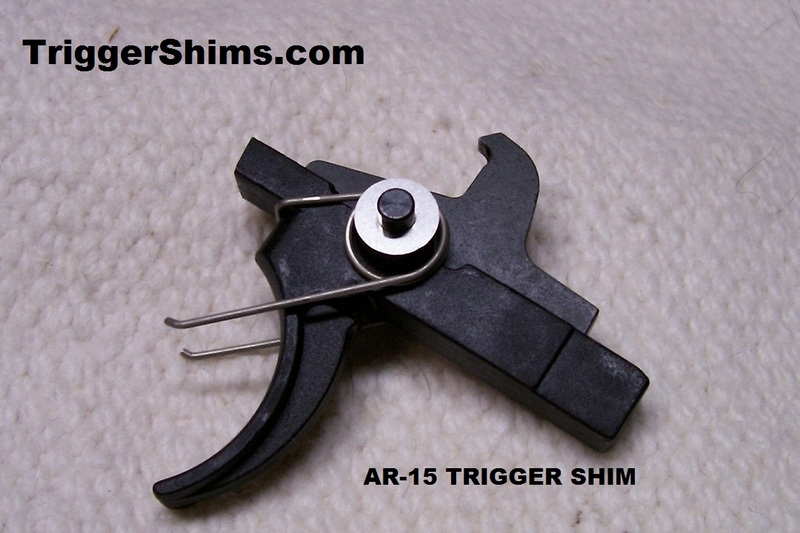 ReInstall the Trigger into the Lower Assembly now that you are Assured the is No Binding Caused by Adding Shims, Once the Trigger Assembly are Installed, it is a Simple Matter to Install the Shims. Simply Push the Trigger Pin out just enough to slide a shim Between the Housing and the Trigger. A Little Gun Oil on the inside of the Lower Housing will Allow the Shim to Stick and Slide Easily with a Tooth Pick into Place, working the Trigger Assembly to Align Shim, slide the Trigger Pin Back into Place. The Hammer and Shims can now be Installed in the Same Manner. Be Sure Again to Check Your Work for Free Movement and No Binding on Trigger/Hammer Parts. Safe Operation is your Sole Responsibility, if you have any question, have it checked by a Competent Gunsmith. Our AR-15 Shims for the Trigger Assembly and Sear are made by us here in the USA out of American Made Materials. Available in 300 Series Stainless Steel, in Standard Mil Spec .154" and Large Pin Colt .170"
12 Pak Assortment has 4 X .002", 4 X .003" and 4 X .005"
Choose Custom Size Pak and enter your sizes in the box below. Lance, Your product (Pivot Pin Shim) is fabulous! My AR is nice and snug now without the use of the polymer wedge inside. I’m absolutely thrilled and have already ordered more of your shims. Great work and I’ll sing your praises on the forums I frequent. and it cured the looseness/wobble between my upper and lower. Wow, you have a great product there guys! Thanks for your quick response, Lance. You do make an excellent product. I've found that I can lightly sand the shim and pivot pin area with 320 wet & dry, clean with naptha or alcohol, and use Dap Rapid Fuse to adhere the (Pivot Pin) shim to my rifle. You can use these shims on your front Pivot Pin to take out the play between the Upper and Lower Receiver. May be used singly or stacked. Fits Standard .276" Pivot Pins / Take-Down Pins of Armalite and clones. Available in 002" through 009" Thickness. Two Pak kits come Standard in .005"
Six Pak kits come Standard in .005"
24 Pak kits come Standard in .005"
30 Pak Gunsmith Special - 5 each of .002" .003" .004" .005" .006" .007"
May be used in combination with an Accu-Wedge. 50 Pak Gunsmith Special - 30 Pcs .005" 10 Pcs .003" 10 Pcs .002"
Gunsmith Special 50 Pak - 30 Pcs .005" 10 Pcs .003" 10 Pcs .002"
I just wanted to say thanks for the takedown pivot shim kit. It completely eliminated the play I had. You saved me a lot of time and prevented me from buying a new upper or lower. The Blue .003 shim fit perfectly. Our Shims will fit Barrels with 1/2" Threads. 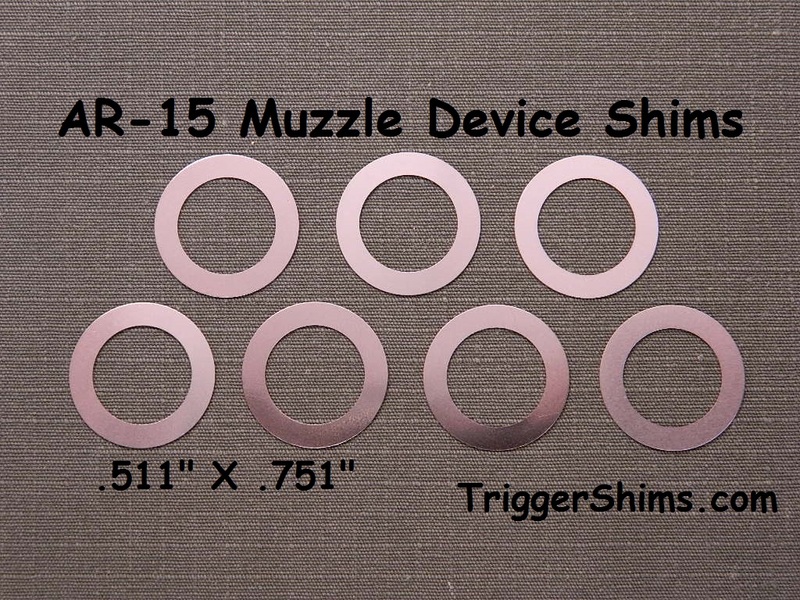 By using Our TriggerShim Brand Muzzle Shims, you will be able to Achieve a Far Greater Degree of Precision than any Crush or Peel Washer. Fast and Easy to Install, our Kit Includes .003" through .009" Shims. 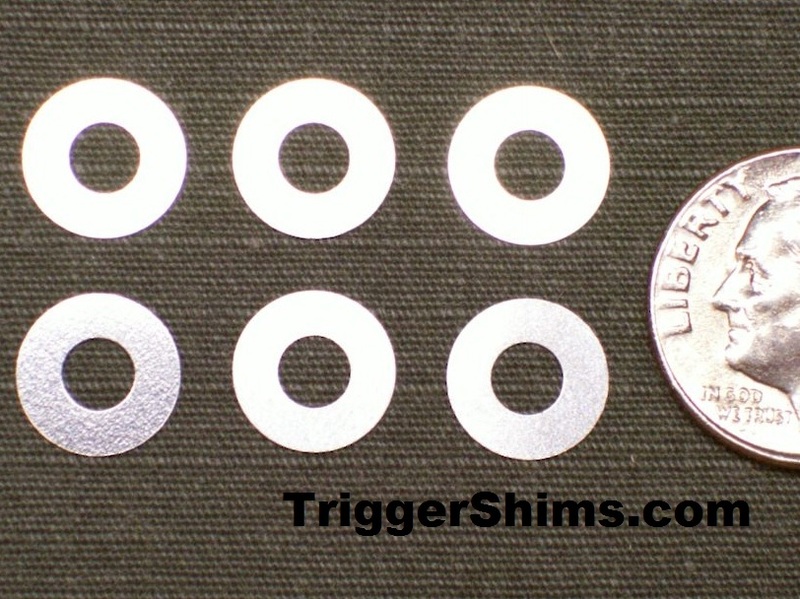 This 7 piece kit is a total of .042" of Shim Stock, Allowing for Full 360 Adjustment. Our 5 Piece Kit allows over 180 degree adjustment. Nominal O.D. of .751" X I.D. of .511"
.003" .004" .005" .006" .007" .008" and .009"
5 Pak Assortment 1 each - .003" .004" .005" .006" .007"
-OR- Choose Custom Size Pak and enter your sizes in the box below. Our Shims will fit Barrels with 5/8" Threads. Nominal O.D. of .751" X I.D. of .634"
Use on both sides of the Bolt Catch as needed. I received my package of shims this week, shipping was fast, packaging and parts are in pristine condition. Got your shims in today. I have a Palmetto State Carbine with a 12 inch free float hand guard. I'm attaching shots of the pivot pin up close with your shims installed. I had to use one .002" shim and one .003" shim to get it just right. It was not the easiest to install but the effort is well worth it. Now the upper to lower fit is rock solid with still smooth operation when opening the rifle. I will try my best to never remove the pivot pin to avoid having to re shim. Excellent product, super fast shipping, incredibly satisfied. Very precise product. Thanks! I looked into it and found Cross Armory manufactures an ingenious little device to replace the Front Takedown Pin. I guess it is because of the "Fixed Mag"
and since I am The Shim Guy, I manufactured them. 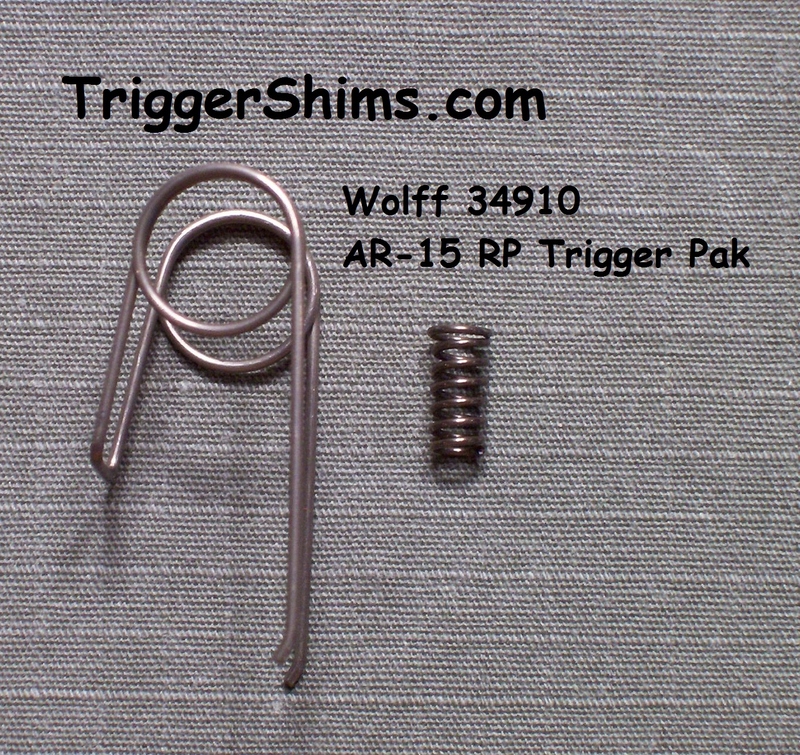 Available in the same size packages as the Standard AR-15 Pivot Pin Shims above. Can be used in combination with our Pivot-Pin Shims. One of the fastest, easiest, cheapest accuracy-improvements you’ll ever find for your AR! 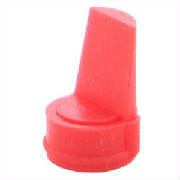 Tough, high-density synthetic rubber wedge drops into the space behind the rear takedown pin in the lower receiver to provide tension between the receiver halves and prevent movement for improved accuracy. Takes the “loose gun” factor out of the equation, so you shoot tight, consistent groups. Can be trimmed to accommodate any variation in upper-to-lower receiver fit. Spending $140 or more for trigger parts on every AR-15 rifle you may own may not be realistic. 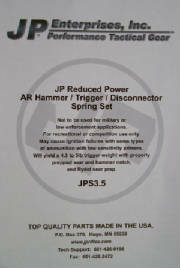 If you can't quite pop for a JP Enterprises complete trigger kit, or have too many rifles and can't justify expensive triggers in all of them, then this may be for you. You can achieve a significant improvement over stock parts by using a set of JP custom trigger/hammer springs. With proper sear and hammer notch preparation, a livable 4.5 to 5.0 smooth trigger in a rifle with standard trigger components is possible. It will not have the extremely short engagement/over travel feel like the JP trigger, but you will have a smooth "roll-off" feel that will give usable trigger control. The spring kit includes trigger, hammer and disconnector spring and complete instructions on how to prep your parts for best results. Note: Use of this spring kit requires the use of US manufactured (domestic) ammunition or reloads with domestic (non-NATO spec) primers as ignition reliability will be reduced with hard low sensitivity primers as found in made foreign made ammunition's and NATO specification ammunition. Use these parts only in rifles for recreational or competition shooting. 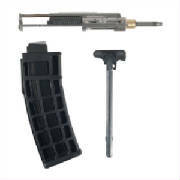 Do not use this spring kit for any defense or duty applications or any AR-10 type rifle. Excellent Fit and Finish, I own one and I think you should too! This is one nice Gas Block, and it should sell for twice this price. I have one on my AR-15, I am very happy with it and I think you will be too! Top Rail Lower than Flat Top by .28"
NOTE: Note: This model works with standard AR15 upper receiver. It may not be compatible with any re-designed, oversized upper receiver. I use them and like them, you will too. Let me tell you about an AR-15 .22 LR Dedicated Upper I built with parts here at TriggerShims and from Brownell's through the links on this page. The conversion kit was made by CMMG and is available in several different configurations. I chose the CMMG Stainless Steel .22 LR Kit because the reviews I read said it didn't require any Break-in Time, and besides, I am a sucker for Stainless Steel. The kit I have is the Bravo Model SS Conversion Kit with 25 Round Magazine, there is an Alpha Model in Black Phosphate, and an Echo Model in SS with Forward Assist. I decided to build a complete Upper Assembly with a Dedicated Barrel, DPMS Flat Top Upper Receiver, Leapers Full Float Tactical Handguard, Leapers Quad Rail Gas Block, (both available above on this page) and cap it off with a DPMS A1 Flash Hider. I like the A1 Flash Hider simply because it is simple, no timing/clock positions to worry about. And cheap, you can pick one up for under $8 at Brownell's or at most any Gun Show. Brownell's has a lot of AR-15 Upper Receivers to choose from, I went with a USA Made DPMS A3 and added a forward assist and Ejection Port Cover. Precision machined from a premium-grade aluminum forging and hardcoat anodized for extra strength, with a tough, scratch-resistant Teflon coating, I know DPMS makes quality products, or I wouldn't recommend them. Brownell's also carries USA Made Receivers from Colt to Aero, Brownell's own brand and others. I have to admit two things, first, shopping for the parts to assemble this gun was a lot of fun, and second, every time I shoot it I grin like a little kid! There are a host of very nice AR-15 .22 clones on the market, from the Umarex Colt M4 OPS I saw at Cabela's for $499 on sale to the Mossberg Clone .22 Rifle at Walmart in the $225 range. The reason I wanted to go with a Build was I could choose my own combination of parts, I enjoy the planning and shopping, and the sense of accomplishment in having it turn out as planned. I could have just added the CMMG .22 conversion to my .223 upper, but I wanted a dedicated .22 barrel and the M4 Contour CMMG AR-15/M16 Dedicated .22 LR Barrel looked like a very nice barrel for the price, with the promise of better accuracy with the 1 in 16" twist rate common in .22 LR rimfire rifles. the CMMG conversion kit came with a chamber adapter for a .223 barrel, (not shown) and the CMMG barrel came with an adapter for .22 which I have changed out on the bolt in the picture. Since I sold off my old upper, I didn't have any parts to reuse, so I had to purchase all the parts here in this picture. You may want to re-purpose some of the parts you have on your .223 cal upper, and that is the great part of this build, all the parts are interchangeable with standard mil-spec AR-15 parts. If you are using a .223 upper, the barrel gets replaced, the gas tube gets removed, and the bolt gets replaced with the conversion bolt. If you are building from the ground up as I did, consider our Leapers UTG Free-Float Quad Rail System for sale above. 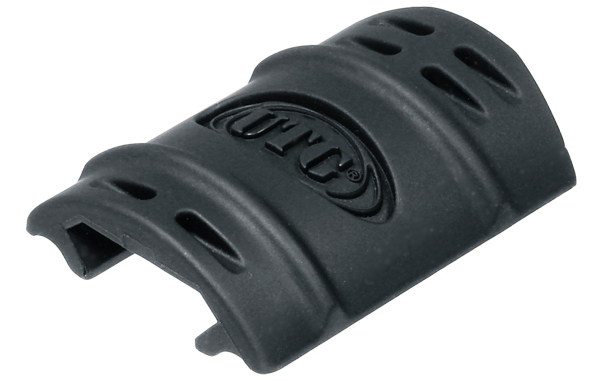 By using the Free Float Quad Rail, you will not need a Delta-Ring Assembly or a HandGuard Cap. You will also need a Front Sight or a Gas Block, not for gas in this case but rather to mount your front sight to. The CMMG Barrel is not cross drilled for an A2 Front Sight, and I wanted a gas block anyway since I was planning on using optics and could always add a clamp-on flip-up fromt sight later. The Leapers UTG Quad Rail Gas Block we sell I can recommend without hesitation. Strong with Excellent Machining and a great Hard Anodized finish, it fits .750" barrels and has 2 set screws instead of one like many have, and it too is Made in the USA! Next, we will be discussing the tools you will need to assemble your AR-15 .22 Rifle conversion. 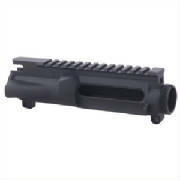 To install or remove a Barrel from a Receiver, you will need an Upper Receiver Action Block. I use Brownells Upper Receiver Action Block as shown in the picture, and have found it to be sturdy and very satisfactory. The Heavy Duty Blocks surround your Receiver inside and out so you can firmly clamp it in a vise without risk of crushing, twisting or distorting it. I use hardwood blocks in my vise to protect the Action Block from damage from the knurling in the vise jaws. need a AR-15/M16 Combination Wrench. I like Rig Universal Gun Grease, and I put a light coat inside and out of the receiver threads, barrel nut and barrel extension. The Barrel Nut needs a minimum of 35 ft lbs of torque, and up to a maximum of 80 ft lbs, so somewhere between those points we need to line up our gas tube holes. The conversion barrel doesn't use a gas tube, but the Free Float Hand Guard depends on it's alignment for proper alignment of the rails. After installing the barrel nut, the Full Float Quad Rail slides on and is held in place with 4 screws included in the hardware kit. Make sure to put a drop of Blue Locktite on the screws and snug down evenly. Slide the Quad Rail Gas Block on the barrel and level it to the upper receiver, put a drop of Locktite on the clamp screws and snug them down too. Last, install the A1 Flash Hider, use a Barrel Vise or Hardwood Blocks in a vise and lightly tighten it on the barrel. Install the Charging Handle and CMMG Bolt and you are ready to mount the Upper Receiver to the Lower. I have had this gun for a year now, and I wanted to do this video to show how easy it was to assemble a Dedicated .22 Cal AR-15 Upper. The CMMG Conversion has worked flawlessly for me and the CMMG WASP Barrel is quite accurate. The whole thing is topped off with a Rimfire Optimized Nikon P-22 2-7X32 with BDC 150 Reticle that not only looks good with the matching AR Platform Rings, but is clear and easy to use. I have had so much fun with this gun that it has achived Favorite Gun Status in my book. If you talk to the folks at CMMG or Nikon, tell them Lance sent you, and I Promised that their products would not disappoint. If you enjoyed this article, drop me a line at Lance@TriggerShims.com and let me know. TriggerShims.com is a Sales Affiliate with Brownells because we believe they have the best products, service and guarantee anywhere. 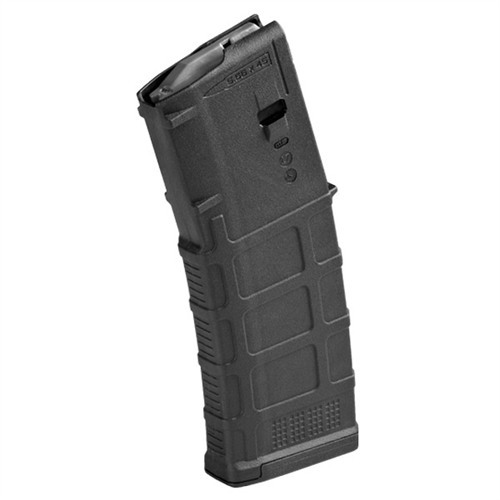 The next-generation PMAG GEN M3 is a 30-round 5.56x45 NATO (.223 Remington) polymer magazine for AR15/M4 compatible weapons. The next-generation PMAG Window GEN M3 features transparent windows to allow rapid visual identification of approximate number of rounds remaining.